It’s cold outside. Snowing, even. I also started classes today. My last semester of college has begun. So, I made stew. It’s just a meat ‘n’ potatoes kind of day. This stuff is going to taste even better tomorrow, I can tell. The greatest aspect of this recipe is altering the ingredients to suit your personal tastes. More meat, additional vegetables, etc. It’s really difficult to mess up, I promise. 1) Coat beef pieces in a bowl with flour, salt and pepper. Cook the meat on medium heat in a large pot with oil until the beef is browned thoroughly. Add onion and soften briefly. Add garlic. 2) Stir in Worcestershire sauce, bay leaves, paprika and allspice. Pour in beef broth and let simmer for about an hour. 3) Add carrots and potatoes and cook until potatoes are soft, for about an hour. 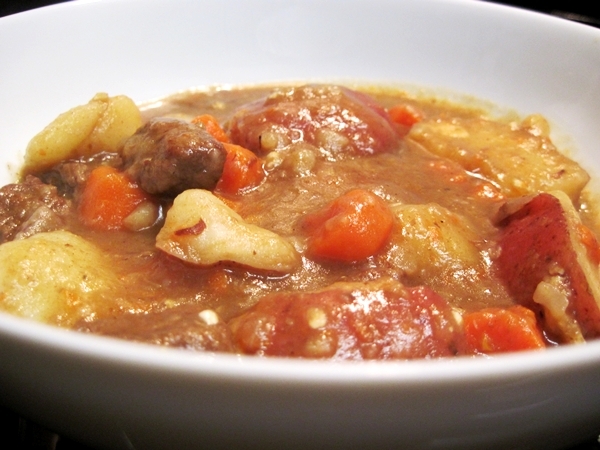 If the stew gravy isn’t thick enough, remove a cup or so of the gravy from the pot and stir in a few tablespoons of cornstarch until all the clumps are gone. Combine back into the stew. 4) Serve with bread for maximum gravy enjoyment. I’m also in the process of writing up my New Year’s resolutions/bucket list for the year. What’s on your list? 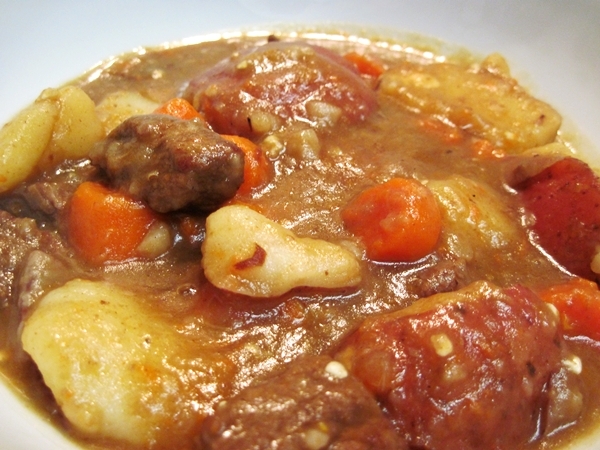 This entry was posted in stew and tagged beef, carrots, potatoes. Bookmark the permalink. Hearty and tasty! Sounds delicious on these cold winter days. Hope all is well! !